Here are some pics of my new routed timber track. It about 20 m long and 3 lane analogue. The track is in 6 panels 1800 x 900 each that bolt together. You can pull it down and store it away when you need the room for something else. It sits on about 12 metal legs from Ikea. Made by a mate who is on this forum (I'll let him jump in and post if he wants everyone to know who he is). It's a great fast track...about 7-8 secs to get around it. Uses magnabraid rather than copper tape - about 70% of the magnetic force of a scaley track. Has sensors for lap timing, still playing with the lighting to get it working but that won't take too long. 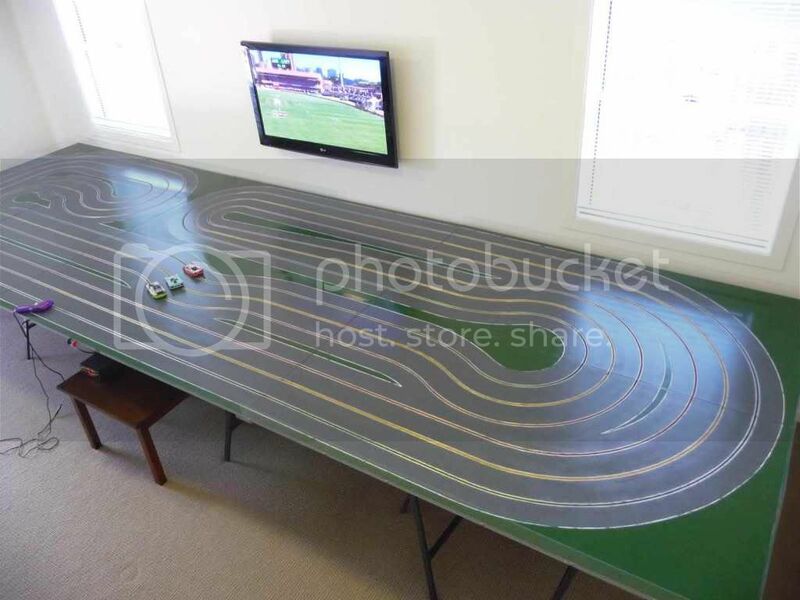 I'm really enjoying racing cars on timber - a step up from plastic and plenty of space around the board for the cars to slide as much as they want. The lane spacing is generous at 110 mm so I can even put 1/24 cars on it. It really loves the Ninco Xlot cars!!! Good looking track you have there Steve . 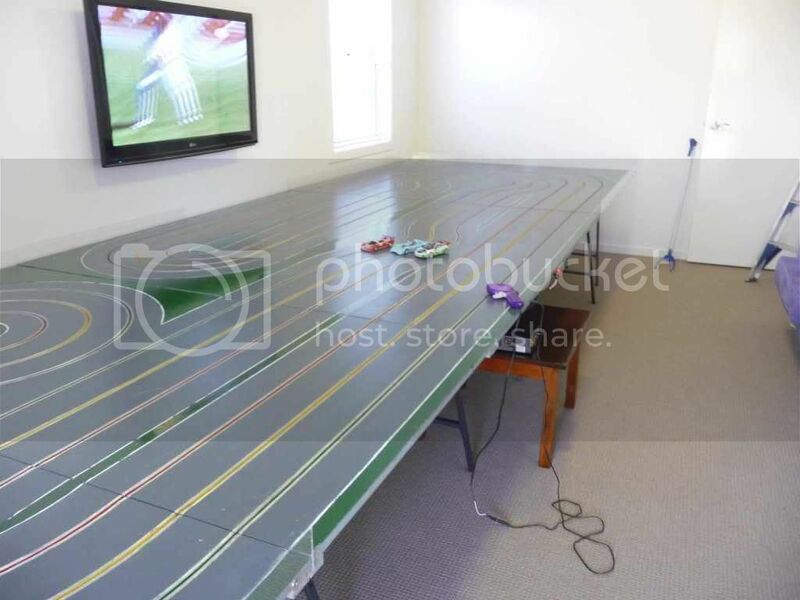 So will you be getting into the scale slot car racing like your track builder mate? Edited by Davnic74, 20 December 2009 - 05:15 PM. Nice track - looks like a slotfire track. Your track looks great Steve and love the TV on the wall. 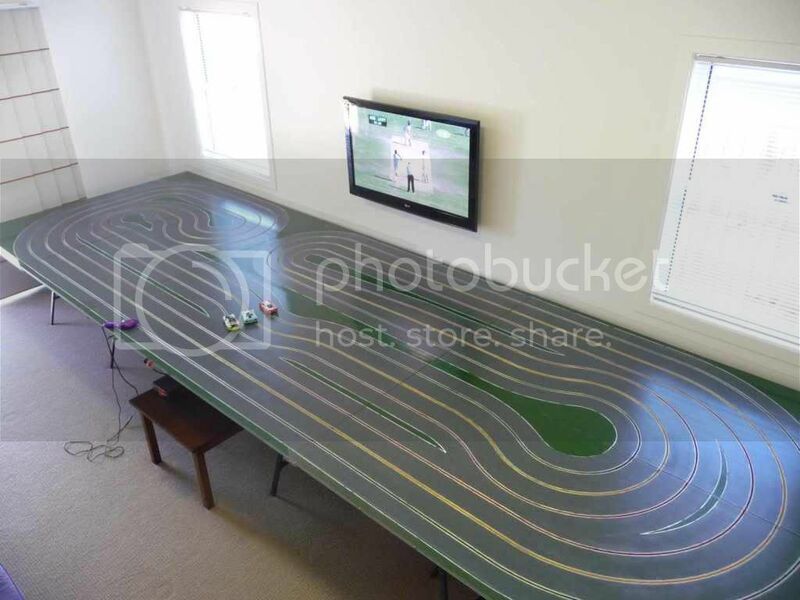 That will be perfect for watching the F1 season while playing slots, something I have been keen to setup with my track for some time. Never seen that timing system before! It's simple and reliable mate. Each time they get out a Pakistani batsmen, the drivers have done about 10 laps. Thanks for the kind words guys. It is a "slotfire inspired" track layout - with a few subtle differences here and there. Very reliable track lap counter, averaged 1 1/2 laps to every Pakistani batsman in the one day series!! !